I'm going to be frank and admit that I've never been a nails type of girl when it comes to beauty. 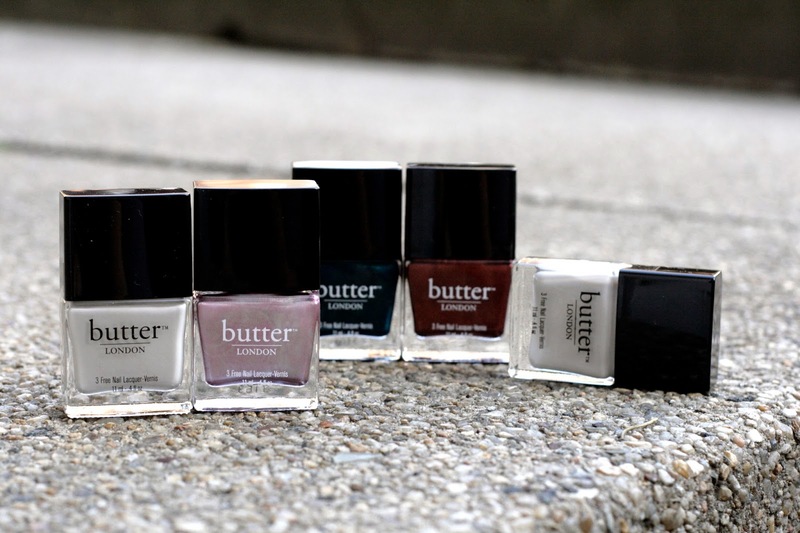 When I saw these Butter London polishes though, I just couldn't resist! I snatched up a set, and haven't looked back since. At $15 a bottle, they're quite pricey - but oh, are they worth it. These polishes are long lasting and go on smooth like butter. I also had a try with some rhinestone sticker sheets from Etude House. Slap a top coat on, and it gives your nails a quick glam look. These crystals lasted surprisingly long too! The first once didn't fall off until practically a week in. All in all, these polishes and stickers are the perfect lineup for those days you're feeling lazy, but want a fun look. For some serious nail art mojo, check out Traci at drinkcitra. You'll seriously be blown away by her talent!